The US Navy is in trouble. The strike aircraft on our carriers have a smaller range than the aircraft on a US Navy carrier in World War II. This limited range puts US Navy carriers at a severe disadvantage against the one opponent they may face in the future, the Chinese. Aircraft carriers are the ultimate symbol of American military dominance. Weighing tens of thousands of tons and costing billions of dollars, these vessels allow the US to project power around the world far from its shores. But according to a retired US Navy captain, the prime time of aircraft carriers may be coming to an end as strategic mistakes committed by the US over the past 20 years has limited these vessel’s capabilities while leaving them open to strikes from new emerging threats. Retired Navy Capt. Jerry Hendrix, writing in the Center for a New American Security, makes the case that aircraft carriers have steadily lost their utility over the past two decades. At fault for this are twin mistakes of the US Navy: a steady introduction of aircraft with decreasing flight ranges in addition to a failure to foresee rising military capabilities from countries like China that could target carriers. “American power and permissive environments were assumed following the end of the Cold War, but the rise of new powers, including China and its pursuit of anti-access/area-denial (A2/AD) strategies and capabilities to include the carrier-killing 1,000 nautical mile (nm) range Dong Feng-21 anti-ship ballistic missile, now threatens to push the Navy back beyond the range of its carrier air wings,” Hendrix notes. Essentially, any carrier that operates within 1,000 nautical miles of Chinese military placements could be open to a strike from an antiship ballistic missile. This would not be a problem, except that the average unrefueled combat range of US carrier air wings operates at half that distance. And even that average combat range is a decrease from the height of the Cold War. In 1956, for example, air wings had an average range of 1,210 nautical miles on internal fuel alone. This range was achieved even though the US Navy was using an older class of aircraft carriers that could support less aircraft than today’s modern carriers. The move to shrink the flight range of carrier air wings occurred following the fall of the Soviet Union and the Navy’s decision to shift the strategic purpose of carriers away from long-range missions toward acting as platforms for faster and shorter-range sortie missions. These decisions meant that the average unrefueled range of carrier air wings since 1996, at 496 nautical miles, are at their lowest point since the 1930s. In 1930, for instance, the average range was 258 nautical miles. By 1943, this range was extended to 758 nautical miles unrefueled. And according to Hendrix, the Navy’s current procurement strategy does nothing to alleviate the issue. The decision to follow through with the F-35 only serves as “completing the retreat from range,” according to Hendrix. The F-35 was meant to replace long-range legacy aircraft such as the F-14 and the A-16 — which are no longer in service — but the F-35’s initial specs of having a combat range of 730 nautical miles was a 75% decrease in capability from those aircraft. 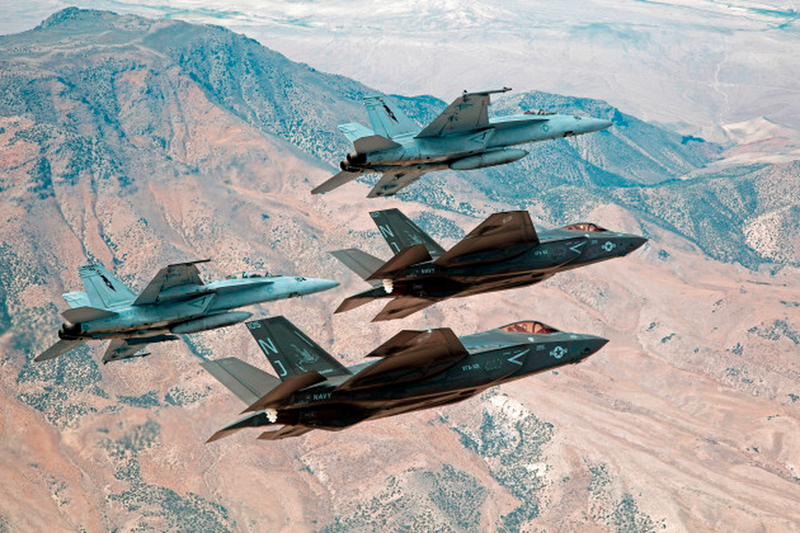 But in actuality, the F-35C’s combat range is expected to be 550 nautical miles, only 50 nautical miles longer than the Navy’s current complement of F/A-18E and F Super Hornets. This lack of range, unless the Navy changes course, will continue to mean that the Navy will have little choice but to continue to operate in waters off potential enemy coasts. And this means that carriers, for all their cost and high-tech capabilities, would either hypothetically fall within range of Chinese anti-ship ballistic missiles or would be forced to operate beyond the un-refueled range of their air wings. …should have kept, and upgraded, the F-14 D. Tom Cruise aside, there is really not much the F/A-18 and F-35 can do better than the Tomcat. Stealth, maybe, but stand off Phoenix type missiles take care of that. People can disagree. Prove me wrong.